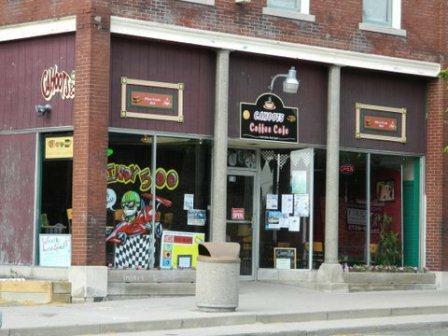 Cahoots Coffee Cafe is our teen coffeehouse ministry which offers safe space for youth. Opened in 2005 in collaboration with the Angola United Methodist Church, and located in a downtown storefront, Cahoots provides intentional programming ranging from pool tournaments to mentors to tutoring to experiences in the arts. Cahoots has developed wonderful partnership with Trine University, Steuben County Literacy Coalition, Indiana Youth Institute and many other local organizations and agencies. Cahoots also offers Moral Reconation Training (MRT) classes to both youth men and young women. This nationally recognized curriculum helps youth to set concrete goals and to figure out what they need to do to achieve them. Many members of our congregation put a great deal of volunteer energy into Cahoots, from directing its activities, handling laundry duty and making cookies, to mentoring local youth. You can visit the Cahoots Coffee Cafe website here.